10% off at Daniels Restaurant and 50% off at The Fells, and $5 off Canterberry Shaker Village. **Free nights equal to number that friends are staying for. Minimum of 2 nights. Valid through Sept 24, 2015. Not valid for weddings, or any vouchers programs. Makes 18 regular sized muffins or 12 jumbo muffins. Melt butter over low heat in a saucepan, whisk in paprika, cayenne and brown sugar. Toss walnut pieces in the butter mixture. Lay walnuts out on a baking pan lined with tin foil, spread the walnuts evenly so they don’t overlap. If there is any butter mixture left in the pan, drizzle over the top of the walnuts. Bake for about 10 minutes or until sugar has caramelized on the walnuts. Line the muffin cups with muffin tin liners. Sift flour, baking soda, kosher salt, baking powder, cinnamon, and nutmeg into a bowl. Add in the banana and chopped walnuts. Bake until golden brown about 25 minutes or until a toothpick inserted into the center comes out dry. 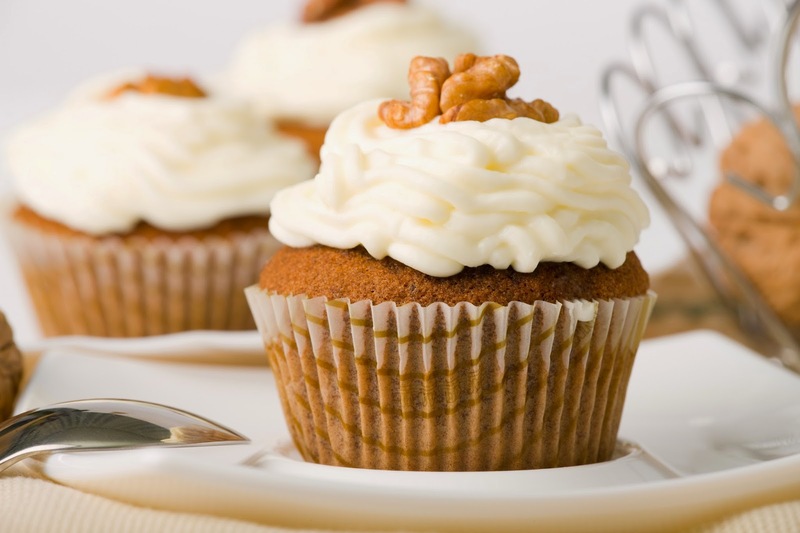 Remove from muffin tins onto wire rack and let cool before frosting. In an electric mixer beat all ingredients until well blended. Chill mixture for a few minutes to firm up before frosting muffins. Garnish with the remaining spiced walnuts. 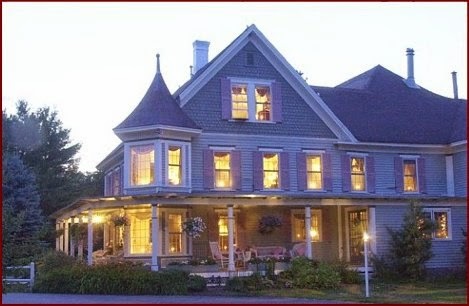 A warm crackling fireplace at a cozy historic Victorian Inn in winter is the perfect setting for guests to endeavor Bridging The Gap and getting in touch with a departed loved one over the weekend of March 6 to 8, 2015. The Bridging The Gap weekend at the Rosewood Country Inn offers guests the opportunity to meet with psychic Lori Ramalho and participate in a session with her. She will offer readings in a small, intimate gallery-type session on both and evenings,March 6 and 7, for a fee of $40 per night. On Saturday, March 7th, she will offer a workshop from on opening yourself to your own natural psychic ability. The cost for this workshop is $10. Additionally, a private half-hour session can be scheduled with Lori onSaturday for $65. There are a limited number of private sessions and they must be reserved in advance through the Inn. Room rates depend upon the accommodation selection, with prices for the two night package starting at $225 for the two nights. This package is exclusive of tax and gratuity and is only available for the period ofMarch 6 to 8, 2015. Lori Ramalho, a psychic medium from birth, uses her gift to assist those that are grieving and those who are lost. Very accurate in her predictions, she has helped many overcome obstacles and make life-changing decisions. Whether receiving messages from beyond, or using her psychic ability to provide guidance, Lori delivers messages with honesty, kindness, and in the most compassionate way. Lori has worked with clients throughout the United States, Great Britain, and all over Europe and has also assisted in many missing persons/murder cases throughout the United States, working with both law enforcement and family members, successfully solving most of them. To make a reservation for the Bridging The Gap package, call the Rosewood Country Inn at 800-938-5273 or e-mail: rosewoodinn@tds.net. The Rosewood Country Inn is the ultimate New England inn providing truly elegant accommodations, luxurious touches, and more than the comforts of home. Set on 12 hilltop acres in Bradford, part of New Hampshire’s Dartmouth/Lake Sunapee Region, the Rosewood Country Inn offers guests luxurious suites with antique beds, fine linens, and country air to lull them to sleep. The suites come with private baths, whirlpool tubs, and all suites have fireplaces. Wireless Internet is available in all rooms. Innkeeper Lesley Marquis provides all of the special touches to make guests feel welcome including a guest-accessible butler’s pantry on the second floor for special late-night snacks. The Inn’s sunlit porches, English gardens, and fine guest chambers reflect a gracious, romantic lifestyle. The Inn also features a large dining room which can seat up to 65 people and a full-service bar. For additional information on the Rosewood Country Inn visit www.rosewoodcountryinn.com.